Heavy duty steel mesh floor for for years of dependability. Safety pins are standard for all doors and side rails. Each pin is attached to the rail by a cable to prevent losing the safety pins. Door Safety Pins gives the door extra strength and allows the door to remain rigid at all times. Safety Restraint Tie Down are standard on all platforms. This gives you a safe place to connect your safety harnesses. 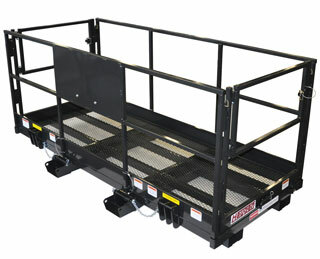 Optional End Fork Slots make it easy to transport your platform. To be used for loading and unloading only. Pins Over Your Fork Tines Each pin is chained to the platform. Fits to most Telehandlers.